During 2015, the average temperature across global land and ocean surfaces was 1.62°F (0.90°C) above the 20th century average. This was the highest among all 136 years in the 1880–2015 record, surpassing the previous record set last year by 0.29°F (0.16°C) and marking the fourth time a global temperature record has been set this century. This is also the largest margin by which the annual global temperature record has been broken. Ten months had record high temperatures for their respective months during the year. The five highest monthly departures from average for any month on record all occurred during 2015. Record warmth was broadly spread around the world, including Central America, the northern half of South America, parts of northern, southern, and eastern Europe stretching into western Asia, a large section of east central Siberia, regions of eastern and southern Africa, large parts of the northeastern and equatorial Pacific, a large swath of the western North Atlantic, most of the Indian Ocean, and parts of the Arctic Ocean. During 2015, the globally-averaged land surface temperature was 2.39°F (1.33°C) above the 20thcentury average. This was the highest among all years in the 1880–2015 record, surpassing the previous record of 2007 by 0.45°F (0.25°C). This is the largest margin by which the annual global land temperature has been broken. During 2015, the globally-averaged sea surface temperature was 1.33°F (0.74°C) above the 20thcentury average. This was the highest among all years in the 1880–2015 record, surpassing the previous record of last year by 0.20°F (0.11°C). Looking above Earth's surface at certain layers of the atmosphere, several different analyses examined NOAA satellite-based data records for the lower and middle troposphere and the lower stratosphere. The 2015 temperature for the lower troposphere (roughly the lowest five miles of the atmosphere) was third highest in the 1979-2015 record, at 0.65°F (0.36°C) above the 1981–2010 average, as analyzed by the University of Alabama Huntsville (UAH). It was also third highest on record, at 0.47°F (0.26°C) above the 1981–2010 average, as analyzed by Remote Sensing Systems (RSS). Record warmth was observed during the September–November seasonal period as well as December. The 2015 temperature for the mid-troposphere (roughly two miles to six miles above the surface) was third highest in the 1979–2015 record, at 0.49°F (0.27°C) above the 1981–2010 average, as analyzed by UAH, and fourth highest on record, at 0.40°F (0.22°C) above the 1981–2010 average, as analyzed by RSS. A routine University of Washington post-analysis found the UAH and RSS values to be 0.65°F (0.36°C) and 0.54°F (0.30°C), respectively, above the 1981–2010 average, both ranking third highest. Record warmth was observed during the September–November seasonal period as well as December. An independent assessment of the mid-troposphere, derived from weather balloons, found the mid-troposphere departure to be 0.92°F (0.51°C) above the 1981–2010 average, the highest in the 58-year period of record. Record warmth was observed during the September–November seasonal period as well as December. The temperature for the lower stratosphere (roughly 10 miles to 13 miles above the surface) was 13th lowest in the 1979–2015 record, at 0.56°F (0.31°C) below the 1981–2010 average, as analyzed by UAH, and 14th lowest on record, at 0.40°F (0.22°C) below the 1981–2010 average, as analyzed by RSS. The stratospheric temperature is decreasing on average while the lower and middle troposphere temperatures are increasing on average, consistent with expectations in a greenhouse-warmed world. According to data from NOAA analyzed by the Rutgers Global Snow Lab, the average annual Northern Hemisphere snow cover extent during 2015 was 9.5 million square miles. This was the 11th smallest annual snow cover extent since records began in 1968 and smallest since 2008. The first half of 2015 saw generally below-normal snow cover extent, with above-average coverage later in the year. Recent polar sea ice extent trends continued in 2015. The average annual sea ice extent in the Arctic was 4.25 million square miles, the sixth smallest annual value of the 37-year period of record. The annual Antarctic sea ice extent was the third largest on record, at 4.92 million square miles, behind 2013 and 2014. Temperature Percentiles December 2015 Blended Land & Sea Surface Temperature Anomalies in °C During December, the average temperature across global land and ocean surfaces was 2.00°F (1.11°C) above the 20th century average. This was the highest for December in the 1880–2015 record, surpassing the previous record of 2014 by 0.52°F (0.29°C). The December temperature departure from average was also the highest departure among all months in the historical record and the first time a monthly departure has reached +2°F from the 20th century average. 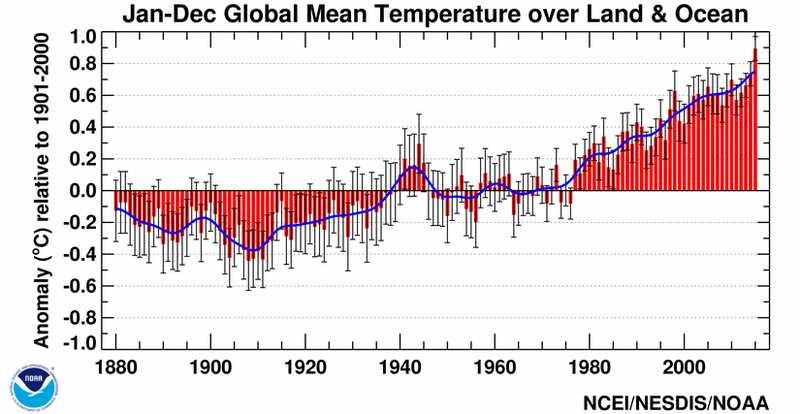 During December, the globally-averaged land surface temperature was 3.40°F (1.89°C) above the 20th century average. This was the highest for December in the 1880–2015 record, surpassing the previous record of 2006 by 0.86°F (0.48°C). During December, the globally-averaged sea surface temperature was 1.49°F (0.83°C) above the 20th century average. This was also the highest for December in the 1880–2015 record, . surpassing the previous record of 2009 by 0.36°F (0.20°C) The average Arctic sea ice extent for December was 300,000 square miles (6.0 percent) below the 1981–2010 average. This was the fourth smallest December extent since records began in 1979, according to analysis by the National Snow and Ice Data Center based on data from NOAA and NASA. Antarctic sea ice during December was 100,000 square miles (0.9 percent) below the 1981–2010 average. According to data from NOAA analyzed by the Rutgers Global Snow Lab, the Northern Hemisphere snow cover extent during December was 190,000 square miles below the 1981-2010 average. This was the 19th smallest December Northern Hemisphere snow cover extent in the 50-year period of record.